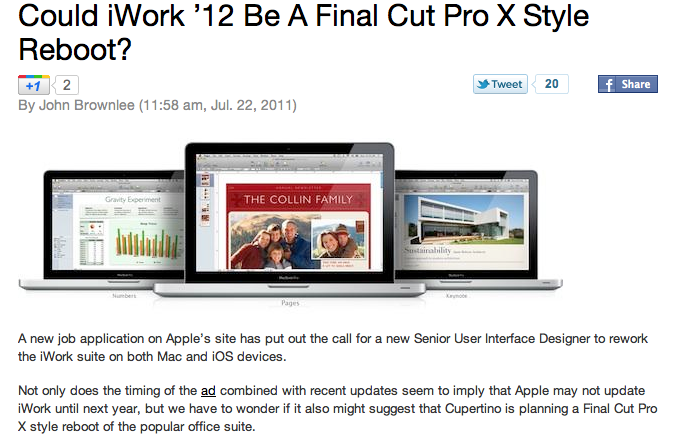 It’s nice to know a week after I suggested it in this blog that well-known blog, Cult of Mac, has also written a day or two ago that it too believes we may see a re-write of Keynote much like has occurred for Final Cut Pro X. The hint it took would appear to be an advertisement for a user interface engineer to join the iWork team. Me, it comes from close observation of Apple as well as having presented to a section of the iWork team with regard to how I think about presenting, using Keynote, and where Keynote needs to go next. One of the things I expressed most forcefully on my meeting in Pittsburgh two years ago was the need for Keynote to have better timing assembly and control both within slides and across slides. The feedback I received indirectly, and which continued when members of the Keynote team attended my Presentation Magic workshops at Macworld, was that it was high priority. If I could read between the lines, the fact that it has not occurred even after five editions of Keynote was not that it wasn’t important but that it needed to be done right. Right in Apple’s vernacular normally means that the senior executives approve it, and in Keynote’s case, since we see it so often used to tell Apple’s story, it’s in Steve Jobs’ hands to give ultimate ascent to any published improvements. As Keynote has grown in sophistication these past eight years, playing leap frog with its sandpit buddy, Powerpoint for Windows and Mac, as well as new kid on the block, Prezi, the demands for high quality presentations has increased, perhaps stimulated by the popularity of sites like TED.com, with its host of wonderful speakers . I don’t include Slideshare and its ilk in this list because of their static nature, and its emphasis on the slides themselves, and not the presentation. Why the emphasis on a Timeline? While presentations, especially in the sciences, remain static, the need for a timeline is low to none. So are transitions and even builds for that matter to judge by the vast majority of science-based presentations I witness at conferences and workshops. If animations are used, it’s usually done so appallingly to bring text in or out. The academic or scientist stands at a podium staring at their Dell or HP laptop or a 17″ monitor hooked into the conference venue’s central server, and hits the mouse, spacebar, or right arrow to advance the next slide or build, if there are builds. But with Keynote’s attractive and different builds, themes, and transitions crying out for their use, especially when others at the same conference are using good ol’ fashioned Powerpoint, the need for more accurate timings of the eye catching, and potentially more engaging and persuasive message delivery has become increasingly important. Powerpoint has had timelines for a while now, but only in its Windows product. And even there it’s buried away. While I’ve demanded a timeline for Keynote, and I have played with Powerpoint for Windows (more toyed with it) I can’t say anything positive or negative about it. Indeed, not many people do, even on those blogs dedicated to Powerpoint. If you google “timeline in Powerpoint” you’ll come up with thousands of websites about how to created a slide showing a timeline effect in Powerpoint, or templates to do likewise, but very few about the functional timeline Powerpoint possesses. One great PPT site is the UK’s m62, and below is a screenshot of how PPT2007 shows its timeline. You can see the movie and description from which this was taken here. But it’s clear that the way the Powerpoint engineers have stuck the advanced timeline away as an option that it’s not considered terribly important. I could be even more harsh with Keynote since one doesn’t exist at all! In fact, if you have a long list of builds on any one slide, you’ll know that changing the timing for one will effect the timings of those builds before and after. And as I have discovered recently, these timings are not rock solid; they seem to be somewhat flexible, such that for one mission critical keynote I had to export the slide to a Quicktime movie and then import the result onto another slide so that with one click all the timings would be spot on permanently since I was playing a movie. Now it’s not as if Apple has no expertise in creating functional timelines. 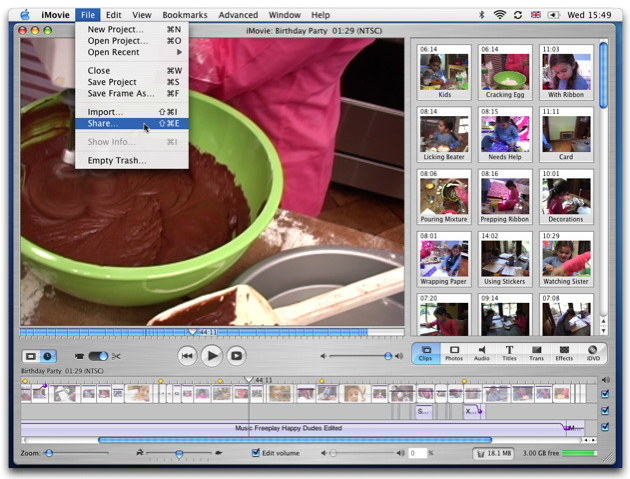 Starting with the original iMovie 1.0, its software has been dominated by timelines which leap off the page as central to the workflow for the application. 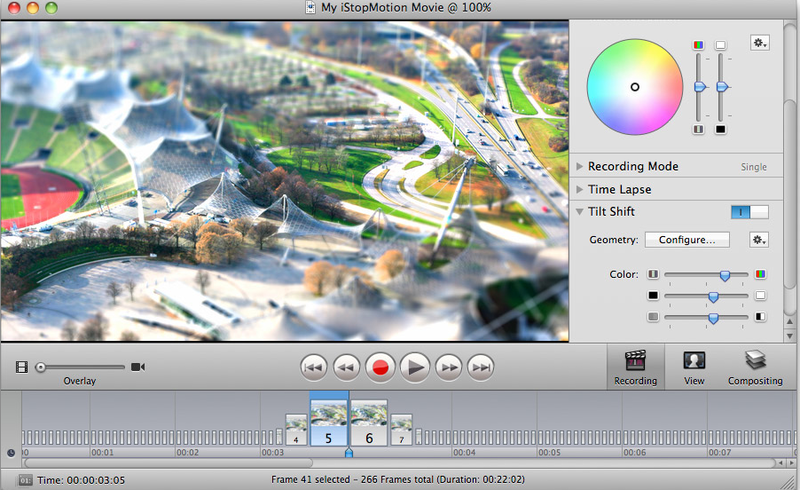 Below, an image of iMovie 4 and its timeline, not too different from the original iMovie 1.0. Later in iLife, with the introduction of Garageband, amateurs got their first taste of using multiple audio timelines, and iDVD can be considered another amateur’s example. And of course in all the professional variations of Final Cut Pro suite, the timeline is the dominant feature for FCP, Motion, DVD Studio Pro, and Soundtrack Pro. 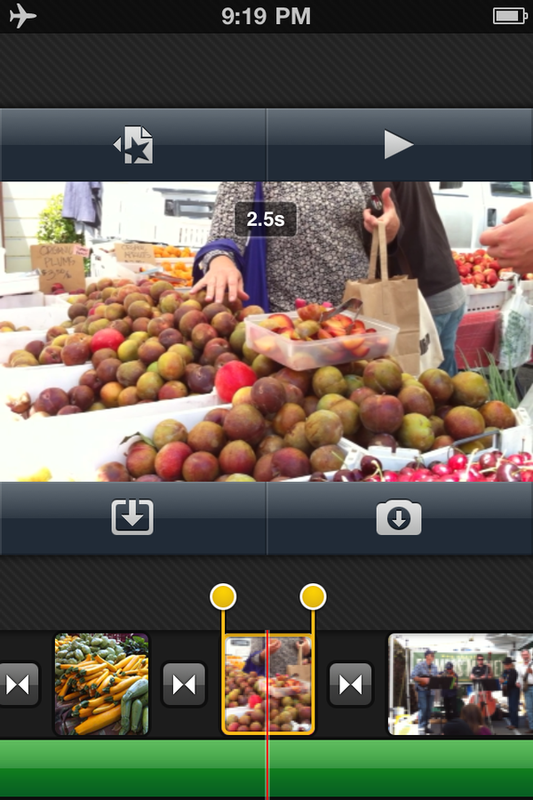 Outside of Apple, few have bettered the timeline implementation experience than the Boinx software folks, with their Fotomagico software as well as BoinxTV, and iStopMotion (below). The other area in which specific timelines has become a very important asset is screen movies, where one is trying to teach the use of software in real time as it were, by recording mouse and window manipulations in real time, with a voice over recorded live or added later, plus special effects like call outs. I think by now you get the idea. There is no shortage of models, good and not so good, for the development of a timeline in Keynote where the timing of events within and across slides can be precisely manipulated. That said, what are the essential elements a timeline in Keynote should do? 1. It ought to provide a live preview of the effect in question, such that it displays in both real time, as well as being scrubbable so that I can see what happens before and after in rapid time. Too often now, I have to wait minutes before I get to see if my current build on a busy slide needs to be tweaked by a second or two. 2. This means I should be able to see a build or effect in the middle of a slide’s sequence, not have to go back to the beginning each time I make an adjustment. 3. I should be able to see multiple builds and actions in relation to each other, much like I can with Garageband’s multiple tracks, where I can see where one starts and one ends precisely. 4. Currently, the builds when individual elements are grouped to act as one are broken. That is, while each element gets its own name, when grouped, each group is simply named “Group.” You have no idea which group the name refers to: not even Group 1, Group 2 etc to give some idea of which group is being worked on. This also causes much headaches when figuring out which group is front or back. 5. 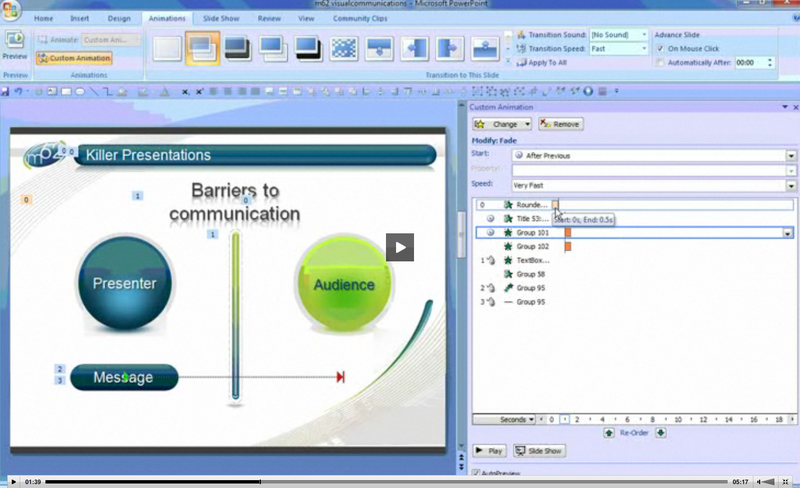 For some time now, Powerpoint has allowed a sound file to play as a transition takes place. While a minor consideration, there are number of times when I have wanted to employ not just a visual but an auditory metaphor when transiting slides. This also goes for having the one track play across several slides for continuity. If you want this now in Keynote, you have to crowd all the elements onto one slide, with one track of music per slide. 6. A well constructed timeline would also make it see much easier to follow and select out individual elements on a complicated, multi-build slide which currently is a virtual nightmare of force forward and back to gain control. The Inspector is little help here currently. If I am right in thinking Keynote will get the Final Cut X treatment, the Inspector will be the first to go and be completely redesigned. These are some of my thoughts on timelines and Keynote. Perhaps for you, it’s not important and other feature sets cry out for implementation. But given the level of work needed to bring these ideas into a future version of Keynote, I am becoming more and more convinced a redesign is necessary. The length of time between updates provides more evidence that this is the case. Having updated today to Lion, one of the first things I then did was check Software Update. There ready to be downloaded was a 96MB update to Keynote 09. No, not a new Keynote, just an update for Lion feature compatibility including auto save, full screen, resume and soon to come, iCloud features. 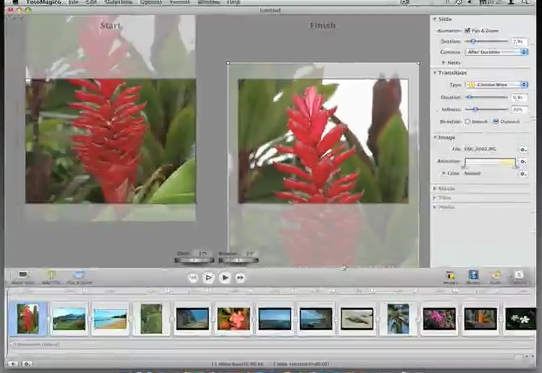 But hidden inside keynote are two builds which we have seen demoed in recent Apple Keynotes. One build in features an image or word dropping and kicking up dust, which Keynote calls “Anvil”; and the second is a build out for text only, which is referred to as “Fall Apart”, where the word’s letters seems to individually break away from the main word and fall. We saw this effect when Steve Jobs first showed the iPad 1 in January 2010 and contrasted it with the current crop of netbooks. The Anvil drop has since been once of the most used builds in subsequent Apple keynotes. A cursory look through Keynote’s transitions shows nothing new, and layout of the inspector and thus feature set is still Keynote 09.